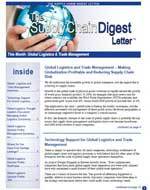 Supply Chain Digest is pleased to announce The Supply Chain Digest Letter, a hard copy newsletter mailed each month to readers and covering a single supply chain topic in depth. 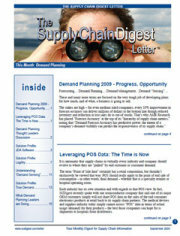 The Supply Chain Digest Letter combines a unique, inviting graphical style and format with the detailed, valuable information and insight for which SCDigest is known. In addition, each issue is released with a special website that provides a wealth of additional information and resources. Complete Resources Pages for each issue, featuring a wealth of information and tools, pdf versions of the issue, and other resources, are made available to subscribers. Limited sponsorships are available for each issue.